This is the same company that made all those beautiful head vases. 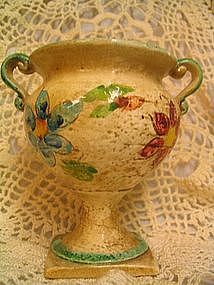 This 4 inch vase was finished in an antique motif which may appear as damage in the photograph. The design extends all the way around the vase. There are no chips or breaks, but there looks to be hairline crack at the base. I can't tell if it is just the finish or if it extends to the interior. It is stable and has been this way for many years, however, I have priced low due to this area. Additional photos available by email. I need your zip code to calculate the postage.